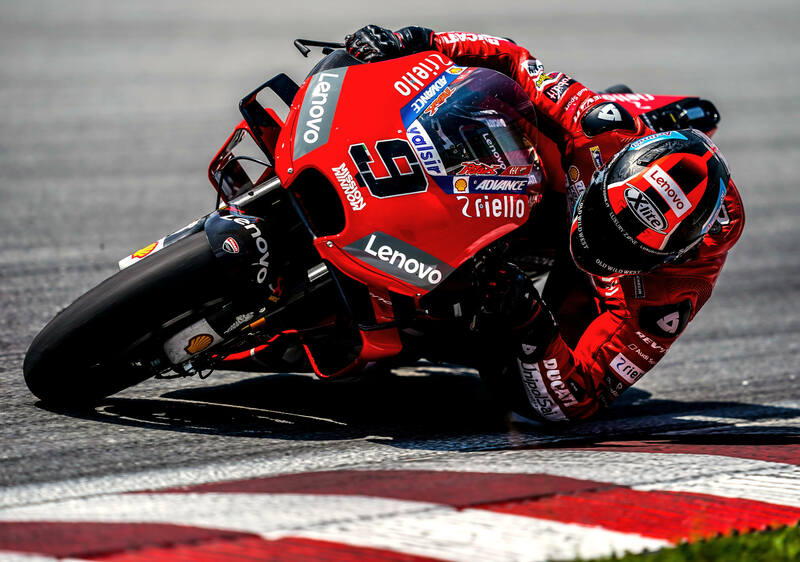 As official testing opened for the 2019 MotoGP championship at Sepang this week, the teams finished three interesting days that ultimately saw Ducati dominate its competition. The top four lap times were all recorded by Ducati riders – each of them breaking the unofficial lap record for the circuit previously held by Jorge Lorenzo. New Factory Ducati rider Danilo Petrucci recorded the fastest lap overall, followed by impressive rookie Francesco Bagnaia (last year’s Moto2 champ). Filling out the top four spots, and also aboard Ducati’s, were Jack Miller in third and Andrea Dovizioso in fourth. Maverick Viñales was the quickest non-Ducati rider – bringing his Factory Yamaha up to the fifth position. Defending MotoGP champ Marc Marquez (Honda) could only manage the 11th quickest time as he nurses his left shoulder back to strength. Time to look for Honda’s new rule change. Crutchlow breaks 17 bones in his foot and comes out and runs with the big dogs. Dude’s a stud. Maybe this will be the breakout year for Jack Miller. And Bagnaia! Great season on the horizon. I am interested to watch Bagnaia. Watching him come up through the lower ranks, he seemed like one of those racers that has a little something extra. Have to agree Jeremy. Sometimes he seemed to have an extra gear when he needed it. Wouldn’t be too surprising to see him win a couple races this year. Hopefully Marc and Jorge will heal quickly and completely. It looks like Cal & Tito are healing up nicely. This should be a great year for MotoGP racing. Zarco in twentieth, shows how far KTM still has to go. That MM had 51% of laps under 2m1s, and Patrucci was 47% under 2m1s, with one good flying lap. MM recovering from shoulder injury. It looks like it will be an interesting year, again with the ducks fast on some days, seemingly lost on others, while Honda and MM always being a threat, and with the championship as their goal. Cant wait for the racing to start. This is TESTING, not racing. Ducati might have been “lost” on some days, or maybe they were just testing new parts. It all means very little until race day. They’re way off of the fast laps that the Factory Ducati’s put down, but so was just about everyone else. in another article I read, Pol Espargaro was very excited at the progress the KTM guys have made with the bike. As Superlight points out, it’s a test, and there are more to come. I’ve always liked Danilo Petrucci. It’s exciting to see him get a top factory ride. Congratulations on his blistering lap! I really enjoy watching him race too. I’m hoping he gets another contract next year with Ducati. There was always something sort of sad about American motorcycle racing when in the 60’s Honda was making 6 cylinder screamers the AMA was twisting itself into knots trying to keep side valve Harley’s competitive. What about the Harley team? I had read that Aleix Espargaro was leaving MotoGP for pro cycling. Guess that’s out..